1. Setup your Yahoo profile & enter basic information. 2. Goto Manage My Updates to enable ‘share my updates’ feature and other settings. Click on Updates tab and check for Manage my Updates option. 3. On Manage My Updates page click ‘show all Yahoo sources’ to select and configure updates from all or specific Yahoo services. 4. To include updates from non-Yahoo services like Youtube, Picasa – goto Show More option under Updates tab. Enter your common username associated with listed websites to get going. 5. 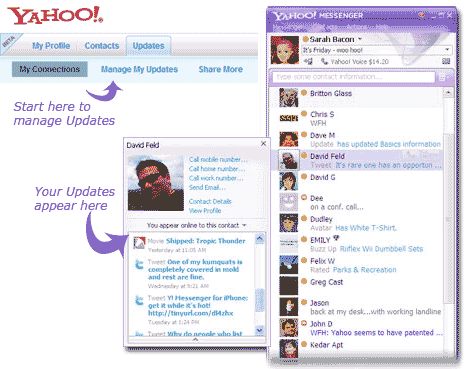 Above steps will setup your updates on Yahoo Messenger. Now your messenger friends will know all about your online activities from uploading a picture to flickr to sending a tweet. Related – How to set ‘I am on SMS” in Yahoo Messenger? In case you are a private person and do not want your online activity information being shared with Yahoo Messenger friends, just goto ‘Manage My Updates’ under Updates tab and uncheck option ‘Share My Updates’. Since Yahoo messenger is for getting chatty and interactive, share my updates feature will appeal to majority of users considering it can dish out updates from both Yahoo and non-Yahoo web services. Like it?